The chancel choir performs during a worship service. take a break after a worship service. Swift Presbyterian Church has choirs to praise God and to enhance the worship experience. The chancel choir continues to work weekly to bring worshipful music for our Sunday services. The advanced and beginner handbell choirs and the Joyful Tones chime choir play for services from time to time. Our chancel choir and advanced handbell choir will be leading worship on March 3, Transfiguration Sunday. The handbell choir will be introducing a new anthem “Sing Them Over Again to Me,” purchased in memory of John Mansell. The season of Lent is a special time in the church year. With it brings opportunities for music participation. Again our chancel choir, handbell choir, beginner handbells, and Joyful Tones chime choir will be leading Holy Week worship services. Our beginner handbells and Joyful Tones will begin rehearsals on March 10. They will rehearse weekly until Holy Week. Many thanks to those assistants who mentor our beginner handbell members weekly so that they can play their very best. Our chancel choir and advaced handbell choir will be leading worship at both Holy Week services. Our beginner handbell choir will play on Good Friday (April 19) and the Joyful Tones will play on both Maundy Thursday (April 18) and Good Friday services. During these two services, the chancel choir will be singing “Awake, Alone in Gethsemane,” a favorite (and difficult) anthem and “Song of Sorrow.” The advanced handbell choir will be leading services by playing “The Cross” and a new arrangement of “The Passion Chorale,” purchased in honor of Keith and Lisa. On Easter Sunday, two new anthems will be introduced: “Easter Carol” (chancel choir) and “Majestic Alleluia” (handbell choir) purchased in memory of Wendell and Florine Williams. 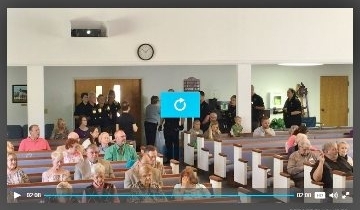 All four groups will be working many hours to bring their very best to these powerful services. They do this because of their love of God, His Church, and the deep meaning of Holy Week. They come to rehearsals so that they can bring life to powerful music that leads us to the cross and to the love that Jesus had for us all. We hope you can join us in worshiping our Lord and Savior. Procession of the bells on All Saints' Sunday, Nov. 6. ♪ The Joyful Tones chime choir — This is an intergenerational group that plays three or four times a year. No music reading skills are necessary. This is a beginner-level group created to introduce people to playing tone chimes, as well as the fun and fellowship that church music offers. Rehearses four or five weeks prior to playing in worship services (usually after 10:00 Sunday services). ♫ Chancel choir prepares 2-to-4-part choral music for weekly worship leadership. This group also welcomes singers to join us as we prepare special programs for Holy Week or Christmas. We also enjoy fun and fellowship, supporting each other through prayer and friendship. We rehearse on Tuesday evenings at 5:45 during the school year, and on Sunday mornings at 9 during the summer. 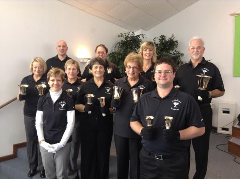 ♪ Handbell choir — We started our handbell choir in summer of 2013 on a trial basis with a borrowed set of bells and chimes. The interest in handbells grew with enthusiasm, and with the help of our generous congregation we purchased a three-octave set of handbells and tone chimes in fall of 2014. Our group has developed skills in techniques and teamwork as we learn anthems and play in worship about every six weeks. We rehearse at 5:30 p.m. on Wednesdays. We welcome people who are willing to start as substitutes for rehearsals, or be a part of ensembles. We take a break for several weeks during the summer. ♫ Intergenerational handbell choir — This is our newest choir and it is for beginners of all ages. WANT TO JOIN one or more of the choirs at Swift? Talk with Lisa Cardwell, music director. Her email is lisacardwell62@gmail.com and her telephone number is (251) 767-0777.